One of the strongest motivations behind the Datawake project is to extend my human sensorium, letting me see into otherwise invisible realms. This takes many forms: data collection systems fed by environmental sensors, embedded probes that report conditions I would never otherwise detect, optics for long-range peering, scanners and software-defined radios for keeping my ear to the ground, infrared camera for seeing in the thermal domain, and a whole toolset for exploring the aquatic realm atop which I float. 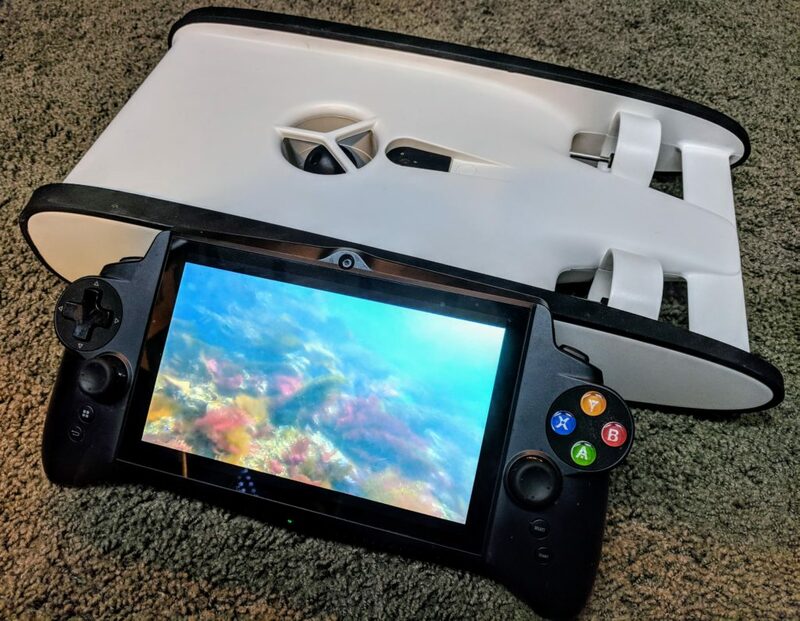 For a quarter century I have been building, cruising, and living aboard boats… yet have never really had much of a sense of what is down there until now. When I began the Microship project in 1993 I was inspired by the oceanographic community, and hung out whenever possible with friends at Scripps and MBARI. I always knew I’d have a sensor sonde, meteorological probes, underwater camera, and hydrophone… but the holy grail of an ROV (Remote-Operated Vehicle) was clearly just a fantasy, with daunting size and cost. But a lot has changed since those days, and Datawake now has a nice little marine-biology and undersea exploration lab (and not just for ogling the critters… we can also inspect ground tackle, check running gear for fouling, and recover dropped tools). For the past couple of months I have been on the Beta team for the new Trident underwater drone. I have gotten to know the seabed near my boat very well, along with a few dives elsewhere in the San Juan Islands. The video quality is astounding, and I can venture into the depths and nose around obstacles, study beasties, amble through dreamlike underwater gardens, and stare in horror at my biology-encrusted hull. What used to be a zone of vague underwater mystery is now familiar, and I’ve watched spawning mollusks, examined ancient structures, followed Dungeness Crabs, giggled at a gaggle of gawking shrimp with unblinking eyes reflecting my headlights, and stumbled across lost artifacts from the world above. I have been eagerly watching for this since I first committed on Kickstarter back in September, 2015… and let me tell you, it has been worth the wait! The Trident is a very ambitious product, with a ton of engineering challenges, but the company had already proven itself with the OpenROV. There is an active developer community, and I met some of the team at the Maker Faire a while back and was confident they could pull it off. Well, they certainly did: the construction quality is first-rate, and they solved some daunting technical problems to pack this kind of functionality into a package so small (roughly 16×8 inches, and a little over 3 inches tall). The full specifications may be found on the Trident product page. 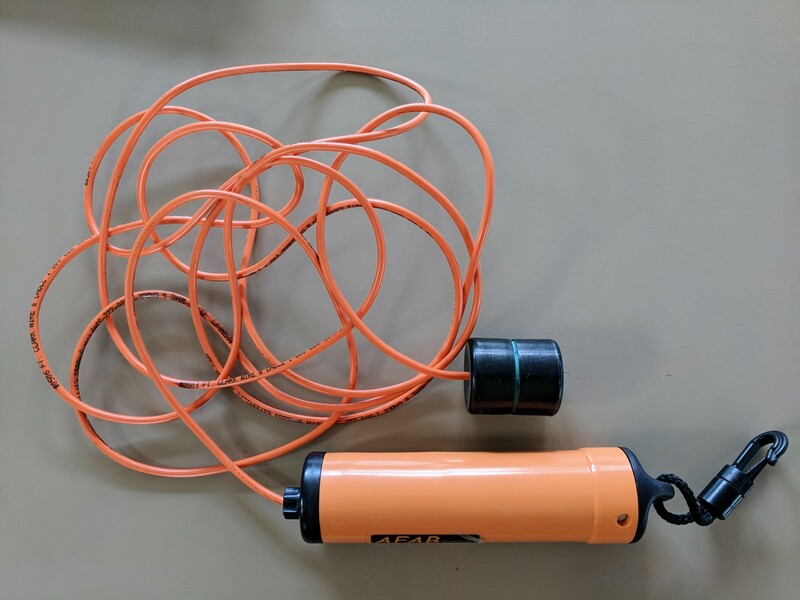 Knowing that I’d want to use my ROV for such things as filming Octopus colonies on underwater cliffs and doing transects of anchorages, I picked up the 100-meter tether option (default is 25m) along with the field case. I also added the JXD controller, even though any Android (and soon iOS) tablet will technically work; I wanted the tactile feedback of integral joysticks and game-style buttons, as well as the convenience of using the same tool as most of the other users. That has paid off, as wet hands are common in this pursuit, and being able to “feel” the controls while carefully watching the live video feed and heads-up compass/depth/dive-angle display. To go for a dive, you simply attach the tether to the “topside” unit that acts as a WiFi access point and is powered by the 95 watt-hour Lithium battery down in the ROV. They did this to minimize the losses of powering motors via a long thin cable; the three wires in the Kevlar tether take care of the low-current supply to the topside box, control inputs, telemetry, and video feed. 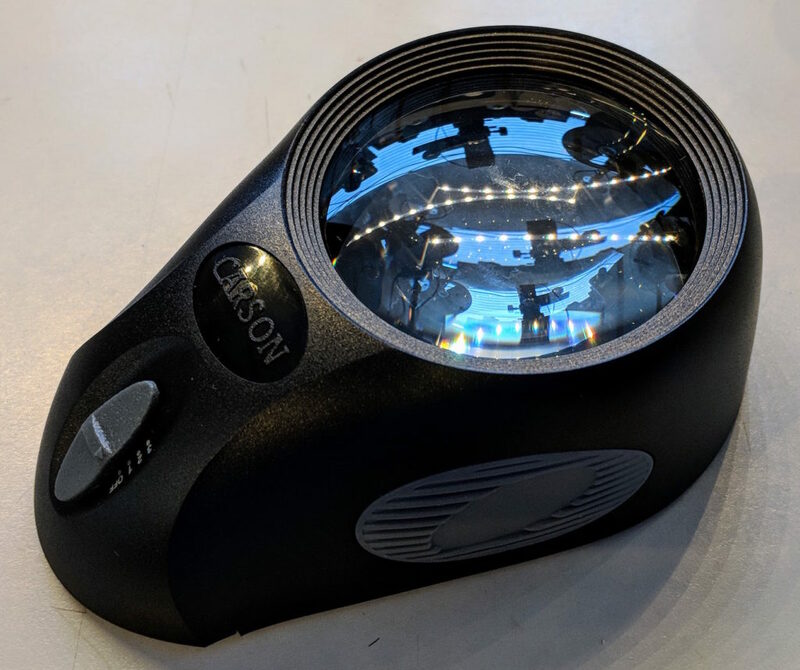 Dive time is on the order of 3-4 hours, including average motor use and some time with the built-in lighting, and it can be recharged in about 1.5 hours. The controller connects wirelessly, and presents a user interface with live video overlaid by instruments… and you simply drive with the joysticks and use other controls (plus a few screen hotspots) to turn on the lights, change speed ranges, and so on… pretty much like flying a drone. Collected video lands in the controller, though there is talk of internal HD storage with higher bandwidth. The files are easy to move to the Mac via Android File Transfer, making it easy to edit them, upload to YouTube, share on Facebook, or whatever… and I have a cable that lets me watch underwater footage on the multi-function monitor that swings on an arm at the end of the Datawake lab console. 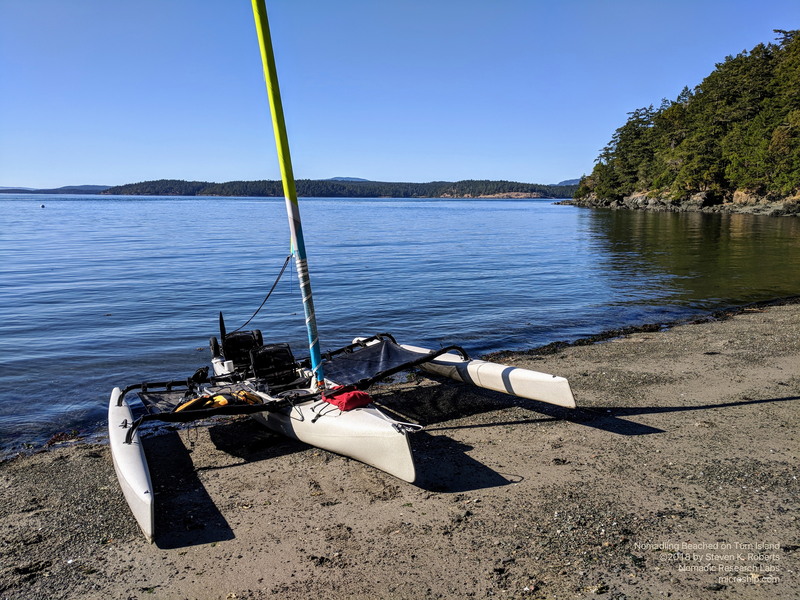 In the three months I have had this magical little robot, I’ve collected dozens of videos of underwater wonders… most of which were filmed right off my stern here in the marina, though I use a friend’s dinghy as well as the little Nomadling trimaran to dive in a few other places near Friday Harbor. 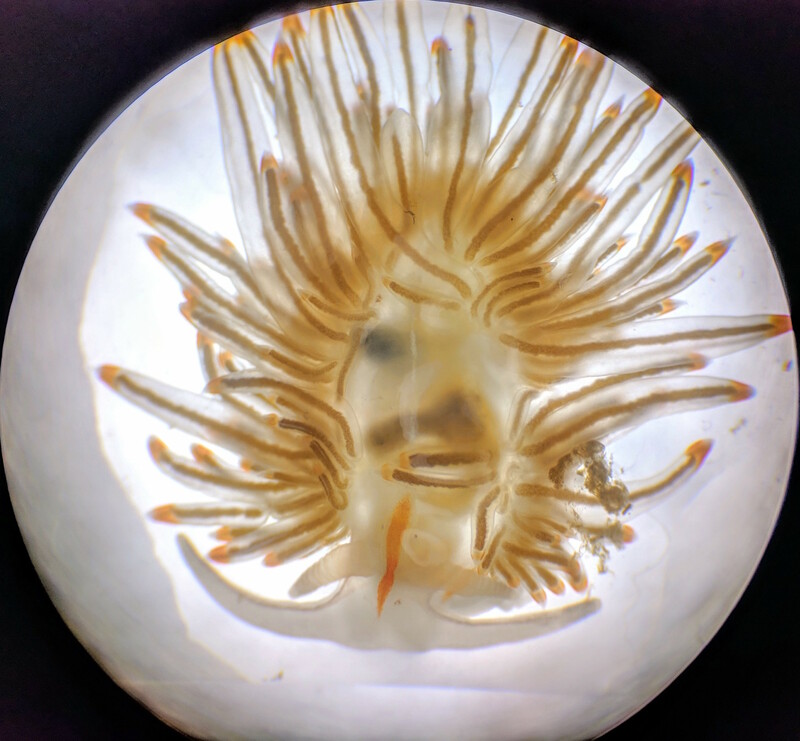 I’ve gotten to know some of the critters who populate these waters, including the festive Alabaster Nudibranch (“garden slug in drag”), Giant White-Plumed Anemones, and of course Dungeness crabs and shrimp. The entire underwater realm is now almost as accessible as taking a walk around the port, with only about five minutes’ preparation necessary to splash the sub and go exploring. As I became familiar with little Ben (Benthic Exploration Node), I started to gather related tools… making it the centerpiece of a compact little boat-scale lab. 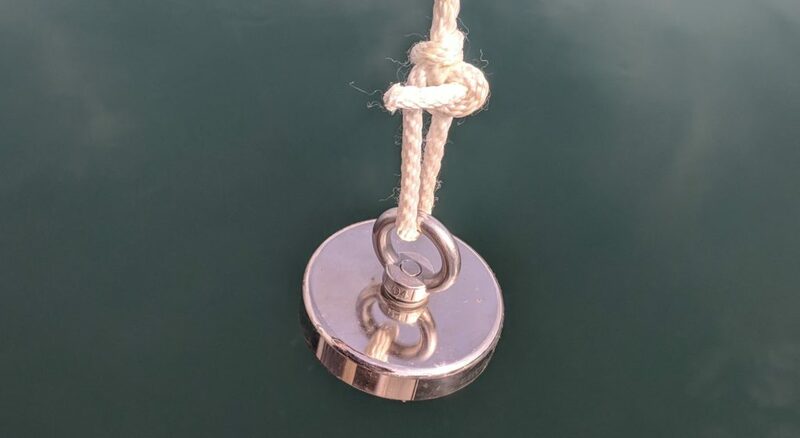 It has pretty well replaced my old monochrome underwater camera that can hang from the boat or be parked next to an item of interest on the seabed… though an extra eyeball might come in handy when trying to snag something with a magnet or hook. 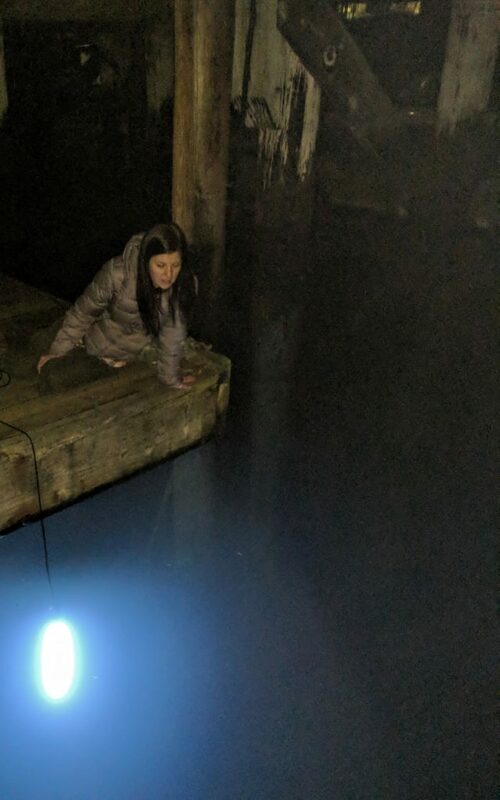 The Enigmatic Sorceress gazes down upon the Orb of Attraction, deep beneath the ancient Docks of Discovery. Clearly this is an essential element in an underwater toolkit, and after reading far too much about the anecdotal merits of different colors (largely aimed at the fishing community) I decided to go with blue since that wavelength affords maximum penetration through the water. 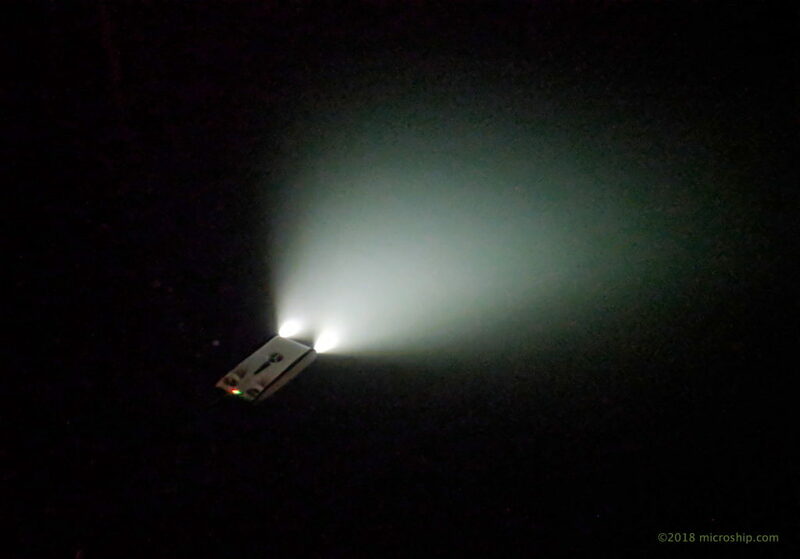 The model I bought for about $25 was the Samdo IP68 12V LED Underwater Fishing Light, and it is insanely bright… drawing all sorts of little wriggling visitors almost immediately after dropping it off the stern and tying it to a cleat. (There is also a white version, which I will add to the kit for better photographic results than the intense blue I have now.) My only modifications were adding a bit of silicone sealant at the ends, on general principle, and lopping off the original “jumper cable” style battery-post clamps in favor of a 12V connector compatible with my Yeti 400 Lithium (a superb portable power system that provides 12V, 5V USB, and sine-wave inverted AC wherever needed). This is something that used to be esoteric and expensive, but is now easy to accomplish with the product line from Aquarian — hydrophones that are made for long-term use in salt water, optimized for the acoustical impedance of that environment, with matching amplifiers available if you don’t already have something aboard. For about $200, you can set up your boat to listen to whales and dolphins, popcorn shrimp, and human sounds… and it is fascinating. 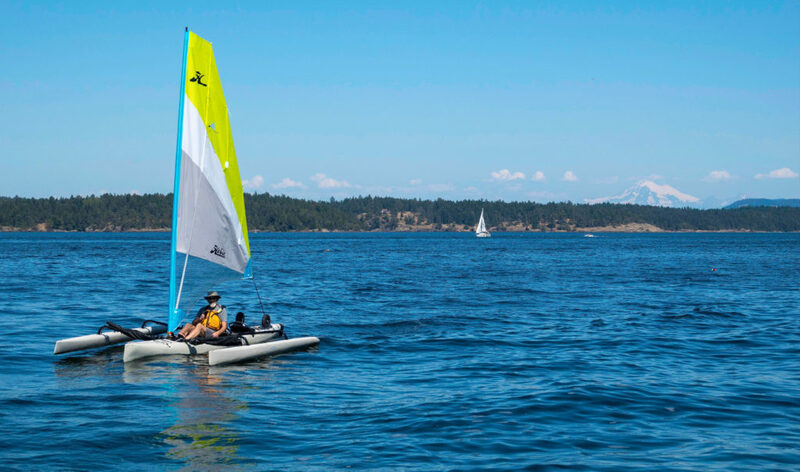 Around here in the San Juan Islands, it is very common to hear orcas… for a sample using streaming hydrophones (along with an available app, if you’re so inclined), check out the OrcaSound site. My own hydrophone is from the early incarnation of Aquarian, and is still going strong… it is designed to drive headphones, and I made a cable to connect it to my boat’s MOTU audio network. This particular model is no longer available, but the photo below is for reference; once I rig a more permanent “science station” on the afterdeck, I will probably upgrade to the H2A-XLR from Aquarian. So we can now look and listen… what about dragging objects up from the deep? I’ve always carried a long-handled fishing net… not for any actual fishing use, but because I entertain the belief that if Isabelle (my cat) ever falls overboard, I might be able to increase her chances of survival with a net. This has seen other uses a couple of times, snagging dropped objects before they drift too far out of reach, but it mostly sits forgotten with the kayak paddles, extra boat hook, and other skinny things. 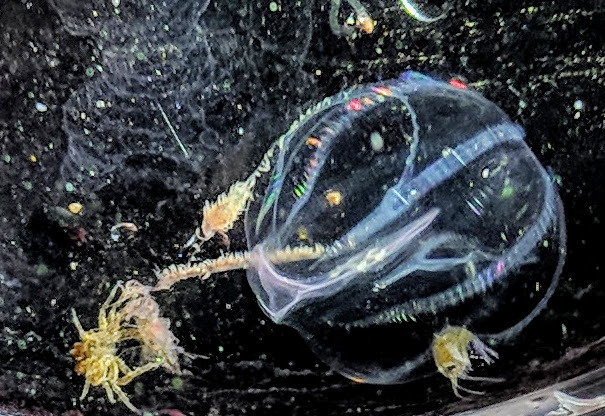 But two recent additions to the “marine lab” aboard Datawake go well with this discussion. First, it is nice to have a way to grab things on the bottom… but important to bear in mind that if you grab something that refuses to move, you might lose your rig. 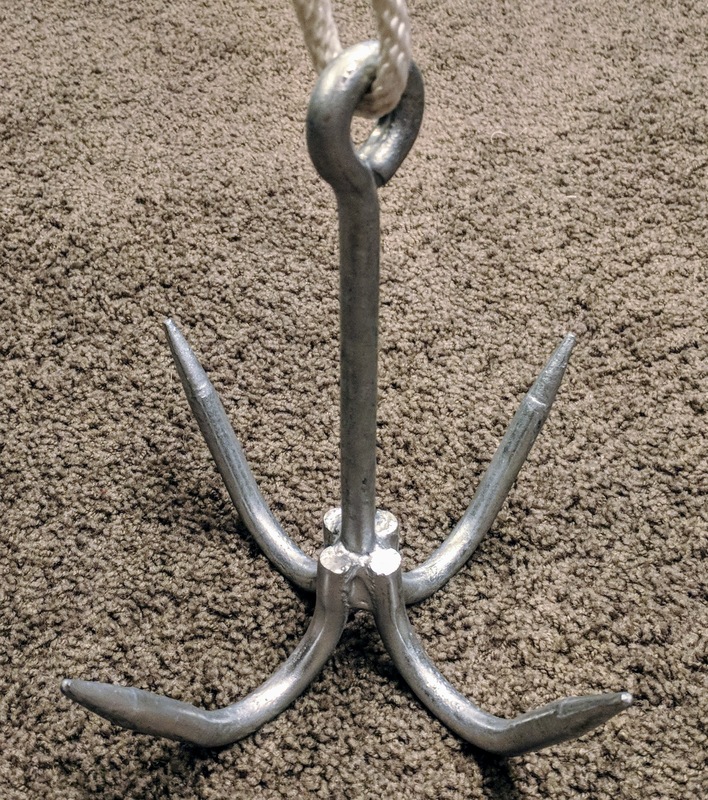 So a cheap, sacrificial grappling hook is a useful tool to have lying around, and if there is a strong possibility of fouling (like ancient cables criss-crossing a seabed, as in Squirrel Cove), you can attach a trip/recovery line with a float as you might to an anchor in similar circumstances. The one shown here is a galvanized unit from a marine-supply store; if I were buying new, I might also consider this pretty little stainless one. That steel shell is 3.5 inches across, and the Neodymium N52 magnet inside is rated at 500 pounds. I have had remarkable results with this, including recovering a friend’s crab trap (deadly to crabs when on the seabed, and not a good thing to leave lying around). It is about $50 on Amazon, and well worth it. The drop that carried those three was picked up by a Sea-Gear plankton net, pulled along by hand at a depth of a few feet off the stern, then allowed to settle a bit. We are gradually going deeper, fascinated by the varying densities of “snow” seen by the ROV at different levels in the water column. Down at the seabed, with the sub lights on, it feels like a blizzard, collecting in piles on the Zostera and the leafy clumps of seaweed, shrimp standing around with “WTF?” thought bubbles as the robot blazes by in the darkness, crab turning to flex their claws as if to say, “dude, you seriously don’t want me to pinch you, whatever kind of weird animal you are…” before continuing their stately scamper, kicking up little clouds and leaving footprints on the seabed. Since acquiring that net, we have seen a similar unit on Amazon for less, but have not had a chance to compare them. I’ll ask my friends at Friday Harbor Labs for recommendations and update this accordingly. This has been a very fast tour through a diverse variety of tools, and I have left out lots of detail. 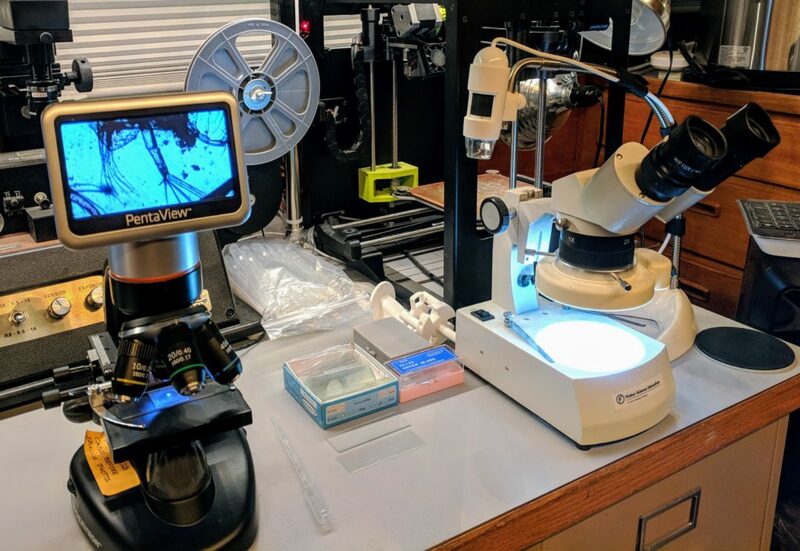 Microscope slides and pipettes, experimental gripper for the ROV, alternative cameras and lighting systems, books, a tether-management system I’m building, sunlight viewing hood for the JXD controller… the key elements here are just the beginning. And I haven’t even begun to show the treasures from the Trident; there will be a whole page on the site just for that, once I compile a few “best of” videos in Final Cut Pro and upload them to YouTube for embedding here. The Trident community is one of the huge draws to this product, and people are building extensions that mate with a well-documented interface (mounting holes, LAN, and command protocols), writing apps for things like transects and surveys, building alternative user-interface tools, experimenting with tracking systems, and publishing more and more footage from their underwater drones… and users are invited to participate in the Open Explorer project, hosted by National Geographic.